You know what’s way more fun than debunking silly arguments about charter schools? And almost as exciting as celebrating fair funding for charter students in two of my favorite districts? New research showing huge improvements in New Orleans, which has the nation’s first all-charter system. …. School leaders in New Orleans talk frequently about how critical flexibility in personnel management is to their overall school success. Free of state and local mandates and constraints from union contracts, leaders reopening schools after the storm could hire anyone they wanted, including uncertified teachers, and dismiss teachers relatively easily. So yeah, the New Orleans reforms were a pretty big deal. They also happen to be rather controversial, so a great many people on both sides of the aisle have been watching the city rather closely. We talked about one piece of research back in January that found some significant transportation and information provision issues in the city’s system. Quite a graph, right? For those who are more statistically minded, those squiggly lines are showing average effect sizes of .2 to .4 standard deviations, which in this case equates to score gains of 8 to 15 percent. Given that we’ve spent billions of dollars on the public education system to see average gains far smaller than that, those numbers are nothing to sneeze at. 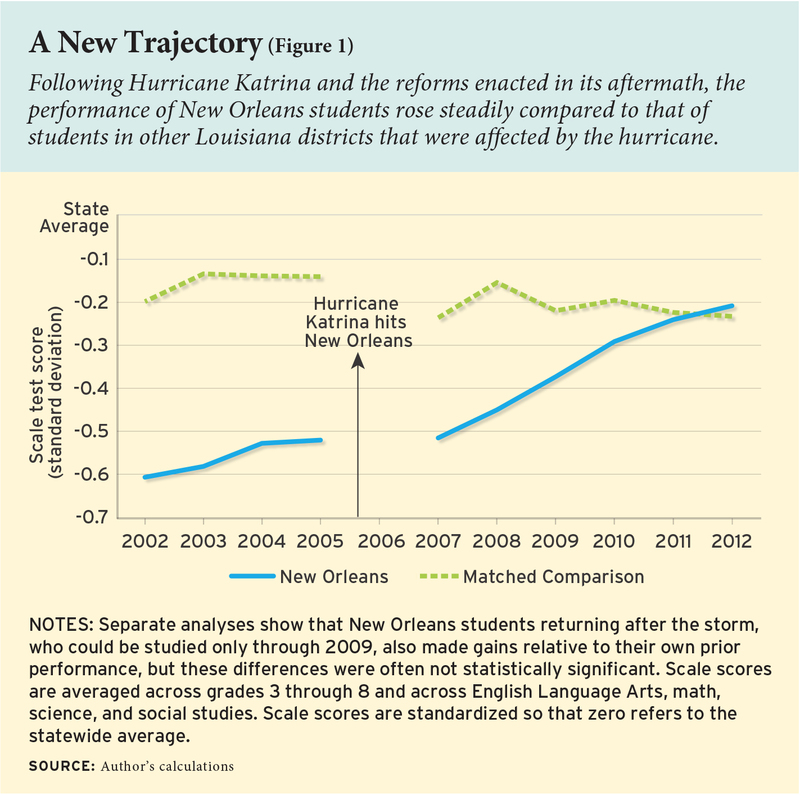 Because I can feel my fellow policy nerds looking at me through the computer screen, these estimates are based on two difference-in-difference approaches: One using only New Orleans students who returned to the city after Katrina, and one using grade-based cohorts. Neither approach is perfect, but that is always the case with education research. And yes, the study makes an attempt to account for things like shifting population characteristics after Katrina, the effects of trauma and disruption caused by the hurricane, and the effects of schools students attended between the hurricane and their return to the city. Harris finds that while some of those factors do diminish the overall average gains to some extent, none of them change the fact that New Orleans students are doing better now than they were under the old system. To address this problem, we estimate effects separately by subject, recognizing that the stakes attached to math and language scores were roughly double the stakes for science and social studies scores during the period under analysis. Also, the state’s social promotion policy raises the stakes for students in grades 4 and 8. We find no evidence that the size of effects varied systematically with the stakes attached to the subjects or grades. However, it is hard to rule out other potential test-based accountability distortions with our data. As further evidence, we considered descriptive information on non-test outcomes. State government reports indicate that, relative to the state as a whole, the New Orleans high school graduation rate and college entry rate (among high school graduates) rose 10 and 14 percentage points, respectively. By nearly any measure, things are looking pretty good for charter students in New Orleans. There is still work to do when it comes to providing better information to low-income families about their options, and helping them physically access those options by finding solutions to the age-old transportation issue. And yes, it’s tough to pinpoint exactly which piece of New Orleans enormous reforms has had the biggest impact. Still, though, I think the quick-and-dirty is this: A completely non-union, choice-based system that throws off the ancient shackles of the “way we’ve always done stuff” can accomplish some pretty awesome things despite arguments to the contrary. In fact, the success of New Orleans reforms raises serious questions about the validity of anti-reform folks’ biggest fears—non-certified teachers, strong accountability systems (including student learning data), a lack of collective bargaining, the presence of large numbers of charters, the involvement of charter management organizations, etc. Not that they’ll be convinced by this study. It is, after all, hard to believe the boogeyman could actually be a knight in shining armor.